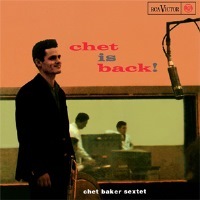 Eastwind Import Home US - Chet Baker Sextet - Chet Is Back! Description: Individually numbered, limited edition reissue from ORG! 180 gram 45 rpm double LP! Remastered by Bernie Grundman from original master tapes and pressed at Pallas in Germany! In a career filled with ups and downs, Chet Baker sounds divine on this 1962 set of bop-driven tunes and elegant standards cut in Italy after the trumpeter's two-year hiatus from recording. Reason for its superiority owes to a sextet anchored by burgeoning, young European musicians such as saxophonist Bobby Jaspar, pianist Amedeo Tommasi, guitarist Rene Thomas, and bassist Benoit Quersin. Compositionally, ballads (including "These Foolish Things" and the only new composition, "Ballata In Forma Di Blues") are tucked in between engaging, uptempo pieces. Yet the most staggering revelation here, aside from the fact that, no exaggeration, Chet Is Back! might contain the "cool" musician's most gorgeous playing, is the version of "Over the Rainbow," given a reading that encapsulates the classic song's longing, hope, and beauty. Noteworthy, too, are Jaspar's statement-making performances. Courtesy of ORG Music, having mastered from the original master tapes, Chet Is Back! benefits from the audiophile-quality sound it's always deserved now 50 years after its original release. Few, if any, audiophile pressings of Baker?? ?s music match the tones and timbres present on this astoundingly transparent reissue. It's what jazz is all about. Recorded on January 5-15, 1962, at RCA Italiana Studios, Rome, Italy. Originally released in 1962 by RCA. This vinyl reissue released by ORG in 2012.